Mr. Kalis provides strategic advice to clients in the development and execution of proactive litigation strategies and strategies to preserve and access corporate insurance programs in response to a variety of novel and substantial claims. He also has served as an arbitrator in arbitrations sited in the United States, the United Kingdom, and Bermuda. Mr. Kalis is the former Chairman and Global Managing Partner of K&L Gates. He is the only law firm leader to be recognized on three of the industry’s most prestigious lists, with The American Lawyer having identified Mr. Kalis as among the 50 most influential innovators in the global legal industry in the last 50 years, The National Law Journal having included him on its inaugural list of the top 50 legal business trailblazers and pioneers, and a leading UK legal publication The Lawyer having named Mr. Kalis as among the 10 individuals in the global profession who will shape the international market for legal services in the next decade. Mr. Kalis is a Rhodes Scholar, receiving his Doctor of Philosophy (D.Phil.) from Oxford University, and his J.D. from Yale Law School. After law school, Mr. Kalis served as law clerk to J. Skelly Wright, Chief Judge of the U.S. Court of Appeals for the District of Columbia Circuit, and for Associate Justice Byron R. White of the U.S. Supreme Court. 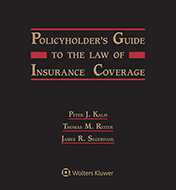 Policyholder's Guide to the Law of Insurance Coverage provides expert guidance through the labyrinth of legal issues surrounding insuring instruments and underlying claims, plus practical strategies and legal arguments to help you secure coverage for contested claims. Buy or subscribe today.